Want to stay up to date on French innovations and news? Opt in to receive periodic e-mails with industry and product news. French utilizes proven engineering and project management tools to help ensure your equipment meets the highest engineering and manufacturing standards. Having been in business for over 115 years, we know what works and what doesn’t. 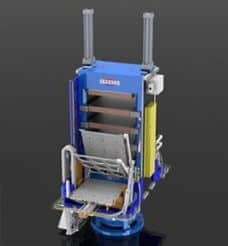 French utilizes modern 3D SolidWorks and CAD software, reducing our engineering time and shortening lead times for you on custom equipment. As a result, you can begin operating your new machines to make product and profit sooner than ever before. Our engineering software allows for quick customization of our machines through parametric designs and we have sophisticated tools to enhance our compatibility with a broad spectrum of drawing formats. 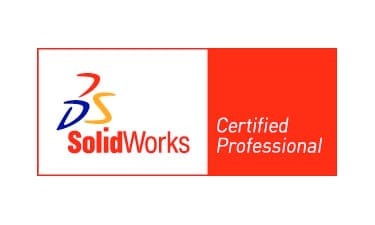 Our team of Certified SolidWorks Users use the latest tools to create assembly diagrams, plant layouts, foundation loading diagrams and detailed machining drawings — all to provide superior value and to be a better partner with our customers. French assigns a dedicated Project Manager for each new order. Schedules, approval drawings, manuals, and questions can all be directed through a single, knowledgeable source. 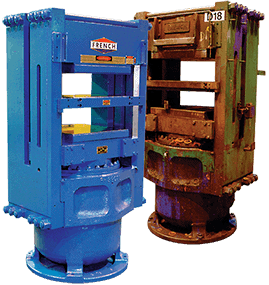 Our Project Managers are matched to each order based upon the machinery involved. We choose our most knowledgeable person for your application in order to make your order flow smoothly through the engineering and manufacturing process. Gantt charts, which allow you to see progress on a weekly or bi-monthly basis, are available upon request. French engineers utilize FEA (finite-element analysis) software and field laser-alignment equipment data to validate machinery designs. In addition, French engineers routinely perform energy studies to reduce operating cost from a utility standpoint. This means you can feel comfortable that you are getting the quality and value for which you paid. Models created in our SolidWorks and CAD software are imported into advanced FEA software and a linear static analysis is performed. Thermal, vibration, and non-linear analysis can also be performed upon request. In addition to computer validations, our engineers have performed “real world” laser alignment experiments in customers’ plants. Our laser testing provides useful data on part deflections as well as confirmation of our engineering analysis. The test data has allowed us to customize various standard design formulas for more accurate results. When creating high-accuracy deflection plots of our parts our engineers exaggerate the deflection as part of their analysis in order to help visualize the deflection patterns the part experiences under “real world” loading conditions. We utilize this data to ensure that our parts can perform well under tough loading conditions while saving weight and cost. To discuss an upcoming project, contact French Engineers for additional information. Copyright © 2019 French Oil Mil Machinery Co. All rights reserved.